I did this walk on Sunday 7th December 2008. I drove down to Wye from where I got the 9:03 train down to Canterbury West. The single ticket cost £3.80. It was a clear bright and frosty morning and I had to spend some time de-icing my car prior to setting off. These minutes almost proved costly as when I arrived at Wye station the level crossing barriers were already across the road. This meant that I could not drive through and park where I had intended and I had to do a quick U turn up to a small layby a little up the road I had just driven down. Quickly gathering up my gear I just had time to run down the rather icy road to the station, reaching the platform just as the train pulled in. 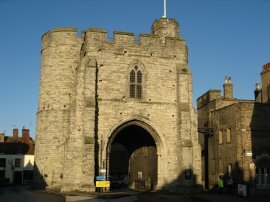 Having arrived at Canterbury West Station I had a 0.7 mile walk through the town back down to where I had finished my previous stage of my walk along the North Downs Way, close to Canterbury Cathedral. 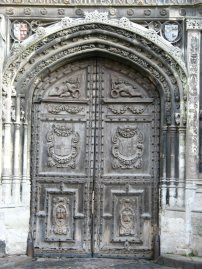 This time the carved wooden door of Christ Church Gate was shut, photo 1, and I was unable to see inside the Cathedral grounds. 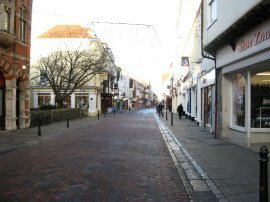 From the Cathedral I headed along the fairly empty High Street, photo 2, down towards the West Gate, photo 3, and on into St Dunstans Street where I past close by Canterbury West station. For this part of the walk I was following the route of the Canterbury Centenary Walk, as I headed to my left along London Road down to the A2050 Rheimes Way. 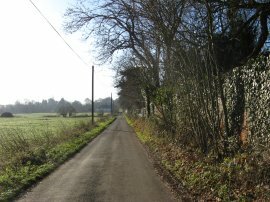 Having crossed Rheims Way I then headed uphill along Mill Lane. 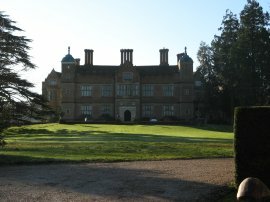 At the end of the lane, by a large gated driveway, the North Downs Way takes a footpath on the right. 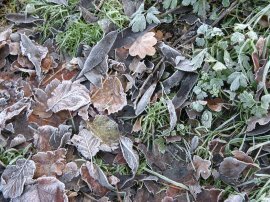 It was still quite cold and the ground was covered in frost, photo 4. The footpath continues ahead running between orchards, the first of many I would pass on this stretch of the walk and over to my right I could see the village of Harbledown, photo 5. After a while the route turns to the right to run parallel with the A2 for a short distance to Faulkners Lane. Here the route turns briefly to the left to cross over the A2 before turning right to enter Bigbury Wood. 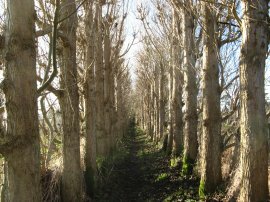 The path then winds its way through the woodland to eventually reach a road at Chartham Hatch. 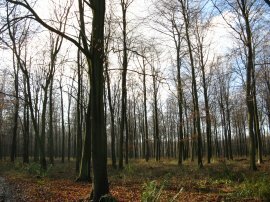 The track through the woodland is generally quite broad and, looking at the leaves on the ground, the trees are mainly Sweet Chestnuts. Leaving the trees for a short distance the route passes along the edge of a grassy field and through an area known as No Man's Orchard, photo 6. Entering the orchard I had noticed that the fruit trees were old, traditional apples trees of the type that I remember in the orchards from when I was younger. I stopped and took some photographs of the trees as they are now quite unusual and a little further on came across an information board which explained how 95% of the old traditional apple orchards in Kent had disappeared in the last forty years, which had been exactly what I had been thinking when I had stopped to take the photos. 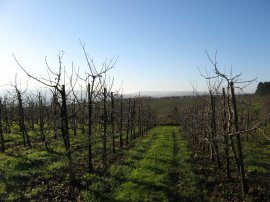 The orchard, covering 10 acres was planted in 1947. Reaching Chartham Hatch, the North Downs Way passes besides a playing field and crosses over Bigbury Road taking a footpath between houses before turning to the right along New Town Street. At the end of the road the route crosses over Hatch Lane and takes a footpath that runs behind past some barn conversions before joining a track that runs alongside an orchard. 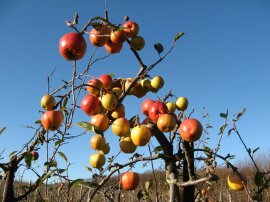 There were one or two of the apples trees in the orchard that had not been harvested and I wondered what the apples would be like. 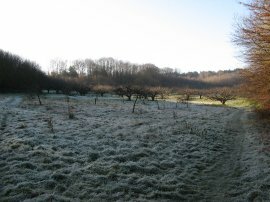 I went up to the tree in photo 7, expecting the apples to be soft and rotten however they were perfectly firm. I picked one and I have to say it was one of the most delicious apples I have ever tasted, icy cool from the morning frost and incredibly sweet and juicy; a really unexpected and enjoyable surprise. 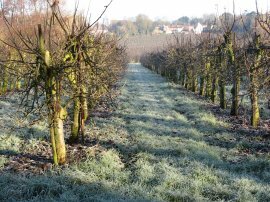 The path makes is way down to a driveway where the route turns left to pass under some railway lines before turning right besides the tracks to pass through an area of fruit pickers caravans and out into more extensive apple orchards, photo 8. Leaving the orchards the route cross a stile into a large field where North Downs Way turns left along the field edge and then follows the field edge round to the right to start heading downhill to cross over a shallow valley where photo 9 was taken. Having crossed the field at the bottom of the valley the route continues along a tree lined footpath, photo 10, to cross the Lower Ensden Road into Lower Lees Road which marks the start of a two and half mile stretch of road walking. Lower Lees Road is followed into the centre of Old Wives Lees. At the end of the road in the centre of the village the route heads to the left down Long Hill which is followed all the way down to cross over the A252 road. The North Downs Way heads straight across the road and into Church Hill on the outskirts of Chilham. 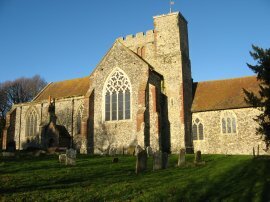 Here the route heads uphill, leaving the road to pass through the churchyard of St Mary Church, photo 11. 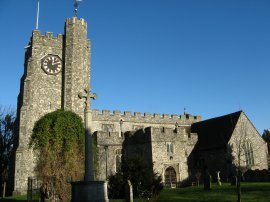 From the churchyard the route then enters the Chilham Square, and attractive space surrounded by a number of fine old building with the church at one end at Chilham Castle, photo 12, at the other. Unfortunately I found it impossible to get a decent picture of the square due to the large number of vehicles parked at every available space, completely obscuring the views of the buildings. 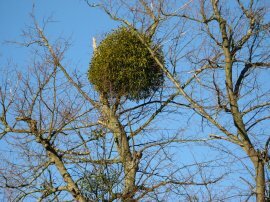 Rather aptly for the time of year, with Christmas fast approaching, I spotted a large clump of mistletoe, photo 13, growing in a tree besides the square although it was a bit too high up to go and get any. From Chilham Square the route heads downhill along School Hill and at the foot of the hill continues ahead along Mountain Street, photo 14. All the roads from Old Wives Lees had been quite quiet with only limited traffic although there was a timely reminder to drivers that walkers might be using the road, photo 15. 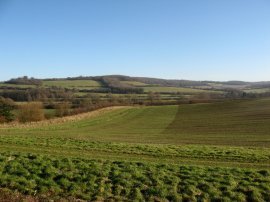 As I made my way along Mountain Street I was able to look across the Stour Valley towards the hills that I had walked over when I walked the Stour Valley Path, earlier in 2008. At the end of Mountain Street route continues ahead on a byway before turning to the right and heading uphill back to the top of the downs along a stretch of path that was quite busy with other walkers. 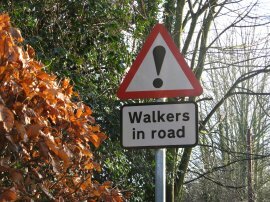 Quite often when I'm out walking I hardly meet anyone else, even though walking is meant to be one of the most popular pastimes. 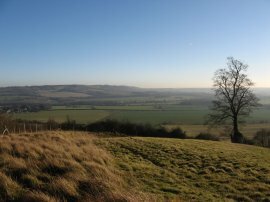 At the top of the hill the route turns to the left to run alongside the edge of a large stretch of woodland that runs along the top of the downs, photo 17, overlooking the Stour Valley. 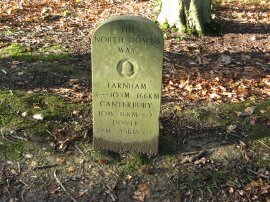 This was a very pleasant and fairly level stretch of path and in the woodland I passed another of the North Downs Way concrete milestones, photo 18. All in all I have spotted 10 of these milestones on the walk, I wonder if there were any that I missed? 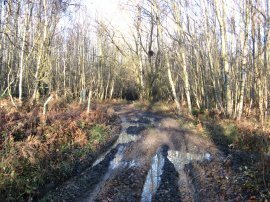 Being a byway, part of the path through the woodland were a little bit muddy, photo 19, although in many places the ground was still reasonably frozen from the heavy frost at the start of the day. The path heads past Godmersham Downs before turning to the left and heading quite steeply down to the base of the downs. Leaving the trees there were once again good views across the Stour valley, photo 20. 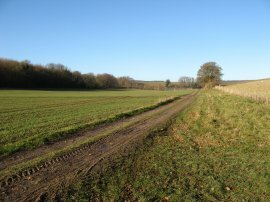 Here the route turns back to the right and after passing through a farmyard heads over fields towards Boughton Aluph from where photo 21 was taken looking back towards the stretch of the North Downs I had just walked, the winter sun casting a long shadow across the field. Leaving the field I crossed the small Church Lane and stopped and had short snack break on a bench under a yew tree at Boughton Aluph church. After my little rest it was then just a very short walk besides a couple of fields down to Malthouse Lane on the edge of Boughton Lees. Reaching the lane I linked up the route of the North Downs Way I had taken towards Dover in stage 7 of the walk, thus completing the full distance of the North Downs Way. 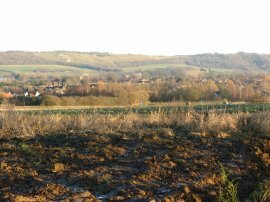 After trying to take a photograph of myself with the camera to record the completion of the walk I turned to my left and followed the Folkestone branch of the North Downs Way back to where I had parked my car in Harville Road in the outskirts of Wye. 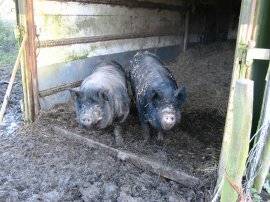 On the way I passed through the grounds of Perry Court Farm where I spotted a couple of pigs in a trailer besides the path, photo 23. 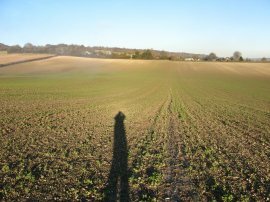 When I reached Malthouse Lane I had walked 11.0 miles along the North Downs Way and the total distance for the day was 12.9 miles. Arriving at the car I noticed that someone had scratched down the side with a key which was rather irritating, more the sort of thing you would expect to happen in Walthamstow than Wye. Thus ended my walk along the North Downs Way, the first National Trail I have walked from end to end. 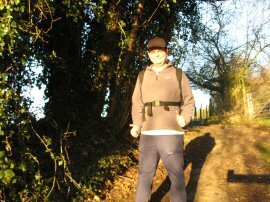 I had enjoyed doing this walk and it seemed a long time ago that I had set off from Farnham back in March. The paths were generally good and well marked making them easy to follow. My GPS made the total length of the path 146.5 miles and I walked this in 11 stages, averaging just under 13.5 miles a time, excluding walks to and from the stations at start at finish points. Generally transport between the stages was good although it was very helpful walking the stages from Caterham and Otford with friends which meant I was able to avoid a couple of long train journeys between the start and finish points.